Marine wildlife watching is one of the fastest growing tourism activities globally. When run responsibly, marine eco-tourism offers a wonderful opportunity for people to view and interact with some of the most spectacular species on our planet. As such, it can change our world outlook, and foster a greater awareness of the unique and fragile nature of life. Yet the long-term future of this expanding and potentially sustainable industry depends entirely on the presence and well-being of wild creatures. It is cruelly ironic, that unless sensible and practical measures are taken to minimize our impact upon them, these creatures may be harmed by our desire to meet and understand them better. With the aim of minimising that potential impact, we developed the WiSe (Wildlife Safe) project in 2003 with a view to developing more sustainable marine life watching by commercial boat operators,. 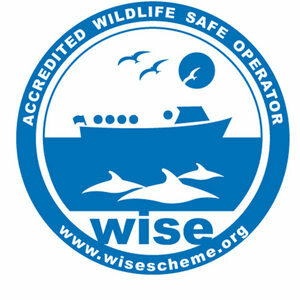 WiSe runs half-day/one-day training courses around the UK for boat skippers, offering practical, scientifically based advice on ways to minimise disturbance of whales, dolphins, basking sharks, seals and seabirds when viewing them. Find out more at The WiSe Scheme website: www.wisescheme.org. Backed by a wide range of Governmental and Charitable Organisations, WiSe has proved highly popular, with nearly 3000 individuals attending courses to date. Wave Action is dedicated to developing the WiSe concept on an international level, and are currently seeking partners who share the same goals. If you feel that the WiSe concept might be of benefit to your local environment, please e-mail us via our Contacts page. Wave Action has developed a WiSe safe watching DVD targeted at the boat owning public, with the aim of educating them to take safe sensible precautions when watching marine wildlife. Ben Fogle kindly narrated the DVD, in his capacity as WWF Ambassador. You can access the films (parts 1 & 2) here.